Totally Spain shortlisted for the Luxury Travel Guide Awards 2016! 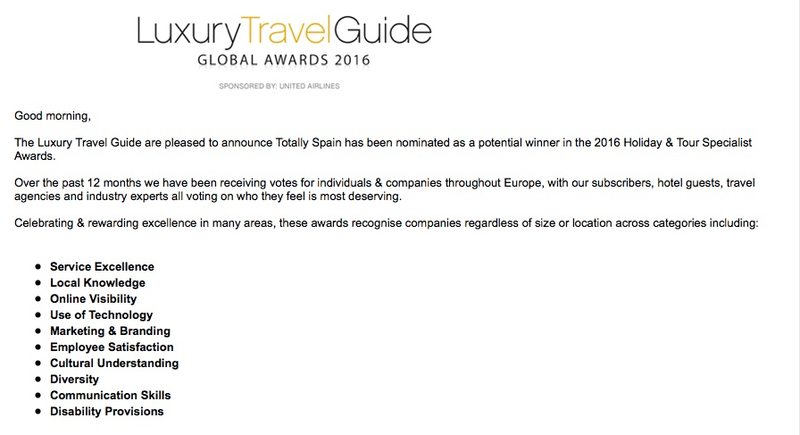 Totally Spain has been shortlisted for the 2016 Holiday & Tour Specialist Awards run by the Luxury Travel Guide! You can see for yourselves below! What a great start to the New Year and in our 16th year in business too. The Luxury Travel Guide Awards is an international awards programme in recognition of all holiday & tour options from large operators to small, independent companies. We’d like to thank everybody who has travelled with us, worked with us and contributed in any way to making this happen. Thanks so much for the nomination and support! Posted in Totally Spain and tagged 2016, Holiday & Tour Specialist Awards, Luxury Travel Guide Global Awards, United Airlines.